Let me introduce you to my pride and joy - Birth Prep! This online birth course has been a labor of love over the past few years, and I’m so proud to finally offer it to you. After a not so great birth experience, I decided I wanted to teach moms how to have the birth experience of their dreams. This course is geared toward moms wanting an un-medicated birth as well as births with an epidural. There are seven modules, covering topics from how to prepare your body for labor to how to care for your newborn. It even includes a hospital checklist, sibling introduction ideas, and a parenthood workbook to help you prepare your heart and mind for this new phase of life. My birth course concept is unique in that it is completely online and fits perfectly to your schedule. As a pregnant momma, you may not have the time or energy to hit up your local hospitals’ countless educational courses. 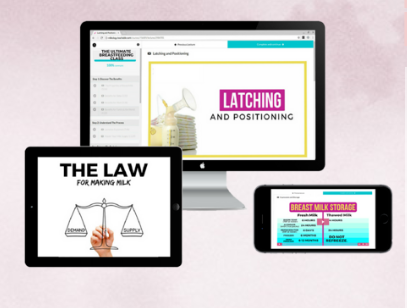 We cover everything you’d learn there, plus you can complete it from the comfort of your sofa! If this sounds like your jam, then head over to our birth prep website for more info and to join the wait list! We launch classes once a month, so that you journey through with other mommas in your phase of pregnancy. Our core belief is that motherhood is better together, and that starts with pregnancy! So let me give you a little backstory on what inspired this birth course dream of mine! After Brody's birth, I felt totally defeated. My labor and delivery experience wasn't at all like I imagined it would be. Instead of being able to enjoy my sweet baby and bond as a family, I was feeling overwhelmed, anxious, and like I had failed. I felt like I totally lost myself and struggled with my identity as a new mom. Then something changed. I decided that I wasn't going to let this first birth experience dictate how I saw myself as a mother. I decided to do something about those feelings of doubt. I began watching videos about birth, reading books on childbirth, and learning that it was possible to have an empowering birth experience. I was inspired to stop dreaming about having a positive birth experience and to become a certified childbirth educator. Over the course of the next year, I completed trainings, observed births, and student taught to earn my certification. I was committed to making sure no mom-to-be felt like I did after my first birth experience. When I found out I was pregnant with Isla, I was so excited to finally put my knowledge to the test. It was nothing like the first time around - no tearing, no screaming, and I got to enjoy every sweet moment with my sweet baby girl. I left the hospital feeling empowered, like I could do anything! I knew right then and there I wanted to share that experience with moms everywhere. I wanted to give moms the tools they would need for a smooth transition from pregnancy to postpartum. So, I created my Birth Prep course, and I am so excited to share it with you. Birth Prep is designed to give you the tools you need to manage your labor and feel totally prepared to have the birth experience that you have dreamed of. It will enable you to leave the hospital with your little one feeling like you're ready to take on anything that comes your way - and with a newborn, anything can happen. Birth Prep is almost like another baby - three years in the making - with so much love, sweat, and a few tears put into it. I've put my heart and soul into this course and I'm so proud of what it has turned into. I believe in it 100%. And I believe in you too, momma. So if you're ready to take control of your birth experience and feel empowered from labor through postpartum, join me for the launch of Birth Prep! Registration is open and will only be open for one week each month. There's a ton of information about the course on the website, and if you have any questions, you can email me and I'll get back to you ASAP! Two of my favorite aspects of the course are the parenthood prep workbook and the free access to Milkology! The Parenthood prep workbook is custom design and full of thoughtful lists and questions for preparing your heart and home for parenthood. My goal with this workbook is to leave you and your partner bonded and ready to dive into parenthood. The Milkology course is a breastfeeding class taught by Certified Lactation Educator, Stacey Stewart. If you are planning to breastfeed, this resource is packed full of goodness to help you on your journey! If you feel like this course would be perfect for you, but the timing isn’t right, then make sure to pin the image below for later! Thank you for your support of Birth Course and all our amazing momma’s to be!